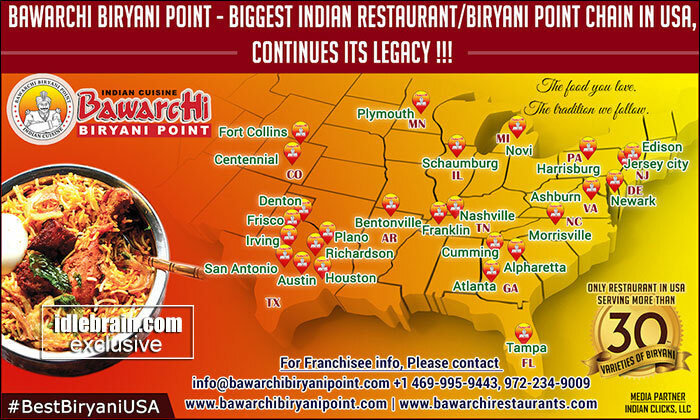 We take great pleasure in announcing that by 2017, Bawarchi Biryani Point will have 50 restaurants in USA. Already in places like Texas, New Jersey, Georgia, Florida, Tennessee, Virginia, etc. Bawarchi Biryani Point has its presence and going by the unprecedented response. Year after Year, this consistent growth was possible due to the phenomenal response from our Customers for Bawarchi’s Mouthwatering Food, Exceptional Service and of course your beloved Biryani!!! Renowned for the most Authentic Biryani and Indian food in the United States, Bawarchi Biryani Point stands out as the first indian restaurant in USA serving over 30 varieties of Biryani’s and to name a few of our Biryani Specialities - Avakai Biryani , Military Biryani, Natukodi Fry Biryani, Ulavacharu Biryani, Gongura Goat Biryani, Srimanthudu Biryani, Panasapattu Biryani, Mirchi Biryani, Benz Biryani, Kunda Biryani, Haseena Biryani, Chicken Dum Biryani, Mutton Dum Biryani, Kheema Dum Biryani etc. Bawarchi Biryani Point has become a TRADEMARK for Biryanis across USA and is the DESTINATION POINT for best biryanis in USA. Along with Biryani specialties, Bawarchi Biryani Point speciliazies in traditional speciaities like -> Maharani Royyala Pulav, Ragi Sangati, Natukodi Iguru Pulav, Mangalagiri Mutton Pulav, Kakinada Kodi Pulav and many more. Bawarchi Biryani Point provides CATERING orders throughout the country. We catered to more than 15,000 people in National conventions and very regularly, we do catering for many BIG and SMALL events across USA. Bawarchi Biryani Point provides catering to all types of events – Personal, Public or Business Events. If you want to open a Bawarchi Biryani Point location, please reach out to us at: [email protected] OR 469-995-9443.